By SteveJ, February 11 in Help Me !! In anticipation of converting the 260Z to TBI, I realized I needed to find a good location for the coolant temperature sensor. I need to confirm, but I believe the sensor that will come with the Patton Machine system will be 3/8 NPT. On the 260Z, I see two potential candidates. The blue painted bolt is 5/8 BSPP if I understand my threads correctly. The challenge with that is I would have to drill and tap the 3/8 NPT hole into that plug as 5/8 BSPP or BSPT adapters are made by unicorns. A better candidate is the temperature switch that is just above the distributor in the picture. Is the thread pitch 3/8 BSPP or BSPT? a later 280zx housing has many sensor threads in it.. the rest you simply close. But the issue remains about what thread types I need to be concerned with. Yes, but i think few people know what thread it is.. You could buy a tool.. it measures the threads (it has multiple plates with the thread in it.) and then buy a tap for tapping it in the housing.. The only hole on the 260 thermostat housing that is NOT tapered threads is the one closest to the head where the temp gauge sender unit goes. Everything else is BSPT. Now as for the sizes... I don't remember offhand. I did a whole bunch of modification to a 260 housing and adapted it to use on my 280, but like many of my projects (when I don't think anyone else could possibly benefit from the details), I didn't keep good notes. The project is done and it worked out great, but I don't have the sizes documented. I can tell you, however, that there is nothing 5/8 BSPT in the 260 housing. That's too big. I believe he largest hole in the 260 housing is 1/2 BSPT which is great because it's the same thread pitch (14 threads / inch) as 1/2 NPT. So I just ran a 1/2-14 NPT tap into the original BSP hole and converted mine from BSPT to NPT. Then you can use easy to find adapters to change from there if necessary. At least that's what I think I did... I'll double check the sizes and let you know for sure. I took my cheap micrometer to the exposed threads of the plug in the large hole. IIRC, it measured 0.818 inches. When I looked up BSP diameters, I found this page:https://www.newmantools.com/taps/bsp.htm, and 5/8 BSP was the closest I found. I did the same to a temperature gauge sender in my parts stash to determine it's 3/8. I'm guessing that the temperature switch would have the same fitting size. However, I couldn't get the micrometer in to measure due to interference by the distributor and radiator hose. So, since I see you have a 280Z coolant temperature sensor sitting right under the thermostat housing you are holding...Will the 280Z coolant temperature sensor fit in temperature switch location on the thermostat housing? No, unfortunately the 280 temp sensor did not fit correctly into that hole.. And that's one of the things I did to the 260 housing was to figure out a way to make that sensor fit. The temp sensor is straight threads and seals with a washer, so not only is the thread pitch wrong, but the sealing style is wrong too. I wasn't thinking this at first, but my project is actually relatively applicable to what you want to do, isn't it? All that said... That's why I think it would be easier to just use an adapter to the other larger hole. That option was not available to me because I had plans for that other hole. I use the larger hole to supply water to my throttle body. I'll check all the sizes when I get a couple moments in the shop. FIrst, the large hole in the 260 housing is 1/2 -14 BSPT. I re-tapped that BSPT hole to 1/2-14 NPT which was really easy since the thread pitch is the same between the two. 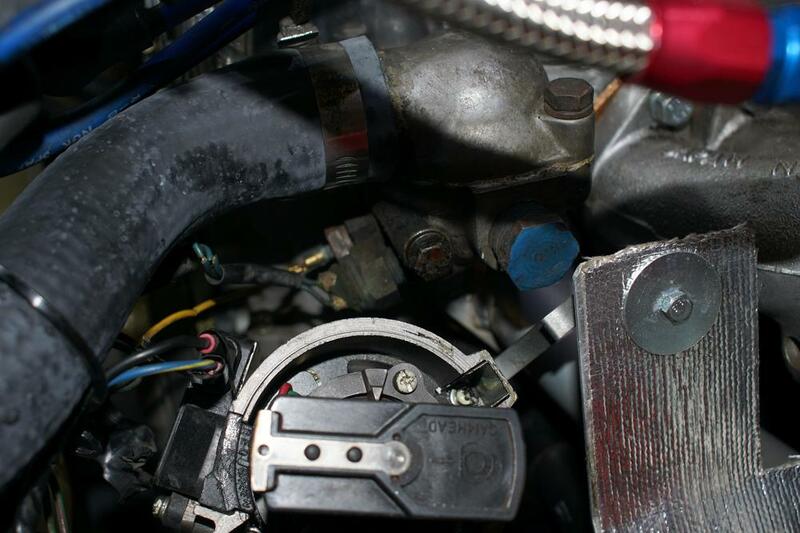 After I did that, I was able to use a common US NPT fitting to duct hot water to my throttle body. I should add that I also bought a CHTS to play with since I have the N47 Maxima head. I'll find out if the 280ZX CHTS fits. My pleasure! That adapter should work fine. Or (if you haven't ordered it yet), I could send you my 1/2 NPT tap and you could just run that into the hole. The trick for me was that I wanted my ninety degree fitting pointing in the correct direction (down) when I was done. So I chased the threads in stages until I was convinced the fitting would get tight at the right location. For you, if you're just running a straight axial adapter, you wouldn't even have to worry about that. Been a while since I looked into it, but I think the only difference between the NPT and BSPT is a small change in the thread form. NPT uses 60 degree threads with a flat at the tips of the threads, and BSPT uses a 55 degree form with rounded roots and crests. Going from BSPT to NPT is easy... Just removes a small amount of metal here and there. Going the other way (from NPT to BSPT) requires more metal removal. Let me know if you would like to do that. So what CHTS did you pick up? Stock Nissan, or something aftermarket? @SteveJ hey I told both plug I took out and the sensor adapter to my local small hardware store and the Plummer guy gave an adapter that worked. Thanks for the offer, Bruce. I have the fitting on order. I'm trying to line up all the support parts I may need so I don't have as much down time on the Z. I even have the 3 screw carburetors sitting in my garage, waiting for the conversion. I sent the check a month ago for the fuel injection kit. It won't be shipped for about another month. I'm guessing a lot of British sports car fans want a winter project, too.